The White family from Rose Cottage on Loughborough Road in Quorn, were always involved in village fundraising events for soldiers during WW1. George and Mary Ann White had three sons in the services and two were killed in action on the Western Front. This photograph came through Muriel White’s family. She was one of George and Mary Ann’s two daughters. On the back of the photograph, someone after the war, (possibly Muriel), has written ‘Stall for sale of dolls to raise money for 1914-18 war charity. 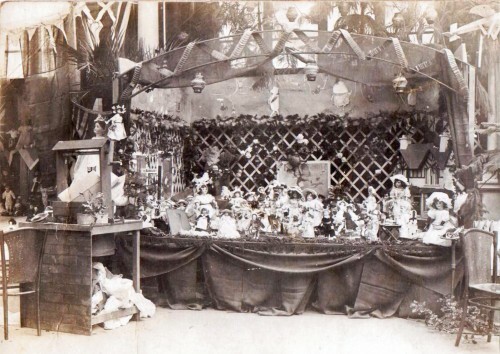 The stall shows dozens of dolls, and a lot of work has gone into the display itself, with a well on the left, a sign to Bambury, Chinese lanterns and a lovely dolls house. The word ‘NURSERY’ can just be made out below the lanterns.